Despite being the biggest wuss when it comes to the c old, I love winter for the simple reason that it’s whitewater paddling season. I spend far too much time checking and rechecking forecasts searching out heavy rain. The chances of getting heavy rain at a time when we are not working, haven’t got family commitments and can find a fellow paddler or two to join us is low. However, when it all comes together it results in a lot of fun. On a Thursday in November, with a clear weekend ahead, and after watching the forecast all week, I was confident there would be enough rain for some boating. I put feelers out and on Friday morning I was excited to hear that Goose had been granted a Saturday day pass from his wife. It was just a matter of deciding where to go. North Wales is our usual ‘go to’ place as it is the closest, however it looked a little risky whether enough rain would fall. I decided that the lake district would be the best bet as several rivers already had enough water in them with more rain forecast. Steve arrived home Friday evening and I filled him in on the plan. He then got straight to the important business of finding a good place on route to stop for breakfast and meet up with Goose. At 6am Saturday morning, Steve was strapping the boats on the car whilst I was scrapping ice off the windscreen in the dark. Normally I hate early mornings and really hate standing in the cold scraping the windscreen, however because it was in the aid of boating, I had a big smile on my face. The drive up to the lake district gave us hail and even snow. A check of Rainchasers showed that the heavy rain forecasted hadn’t made it’s way into the rivers and seeing the white hills in the lake district we concluded that the rain had actually fallen as snow. 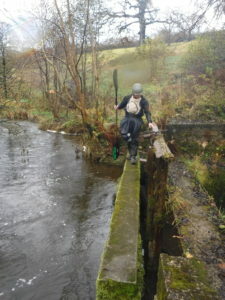 Despite this we had a few rivers we could choose from. 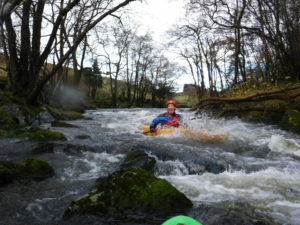 The decision over breakfast was whether to paddle the Lune, a grade 2+/3 river that we’d all paddled previously and knew was good fun or the Mint, a grade 3 river that sounded fun in the guidebook that none of us had paddled before. We decided on the Mint. The guidebook says to check the level is high enough by peering over a bridge. We found said bridge and it was a go-er. Myself and Steve love exploring new rivers. Finding the get on usually takes you to stunningly remote parts of the countryside and this was the case here. Once boats were off roofs and we were kitted up, Steve and Goose left to do the shuttle. Whilst I was waiting for their return, one of the locals popped out of her farmhouse and headed towards me. I was trying to read her body language to determine whether this was going to be a pleasant meeting or a ‘get off my land and river’ kinda meeting. I couldn’t decide so with moments to spare I put on my biggest, friendliest smile, offered my best “Good Morning” and waited for the response. I had a big sigh of relief as she returned the Good Morning. We then had a good old chat. Steve and Goose returned, we jumped on the river and were waved off by the local lady. 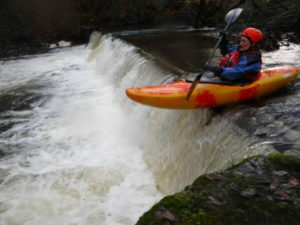 Steve loves leading down new rivers. You’ve gotta be 100 % on the ball as you never know what’s round the next corner. What turned out to be round the next corner was fun followed by even more fun. We did have to be careful of the odd fallen tree and wire fence though. The start of the river was slightly low and thus a lot of steering round rocks was required. At one point Steve got stuck on a rock and having not left enough space between us, I ended up piling up behind him on the rock. This didn’t leave Goose much of the river to navigate around us which resulted in a capsize by Goose. His paddle got stuck which prevented a roll but luckily didn’t go for his deck, giving Steve chance to paddle up next to him offering a successful T-rescue. After a little chuckle by us all, off we went again. Other rivers soon joined resulting in higher water levels. We were constantly on the look out for sereval reference features mentioned in the guidebook such as ‘a pipe bridge with a house on the corner’ that we had to keep right on the rapid which followed etc. These kind of descriptions make perfect sense when you eventually come to the feature but there are always many false alerts and much questioning before such as ‘is that the bridge?’, ‘what about that house?’. When we finally got to the feature in question we had forgotten which line the guidebook had advised us to take anyway. Lots of good rapids followed before we came to a horizon level which on inspection turned out to be a weir with a 1.5m drop. We were pleased to find at this water level it was safe to paddle if we kept river left. 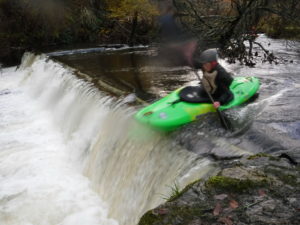 Steve was ready with camera and throwline whilst myself and Goose paddled the weir. We then waited at the bottom whilst Steve paddled over. Goose decided to get his iphone out to take a photo and the next thing I see is the iphone leading down the next rapid with Goose in full chase. To Goose’s relief he caught up with it. This gave us another little chuckle. The next notable feature came in the form of a drop with a sizeable stopper at the bottom. I remembered this from the guidebook as it said to take the left line if you like backloops. We decided the best line to take was right of centre. Steve paddled it first, broke out and got out of his boat to set up throwline safety. The throwline wasn’t deployed as we got the line right. More fun rapids followed before Steve instructed us to eddy out whilst he had a quick look down the final rapid. He reported back that the rapid would leave us grinning from ear to ear and if in doubt keep left. From this limited description I wasn’t quite sure what to expect but Steve was in fact correct as we paddled a 100m long big, bouncy, high volume rapid with big grins. Soon after we were at the get out which happened to be Morrisons in Kendal. 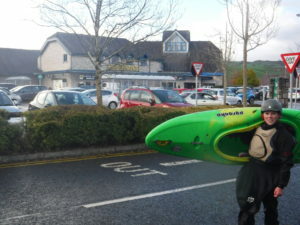 There we were carrying our boats and getting changed in the carpark surrounded by Saturday shoppers. We stopped at Morrisons cafe for a quick cup of tea before retrieving Steve’s car from the get on and saying our goodbyes. A great day’s paddling!